This morning after showering and a quick breakfast we hit the road towards the Indian Creek Camping Resort, Geneva-on-the-Lake www.indiancreekresort.com , about 50 miles away on the shore of Lake Erie. As we are a couple of days ahead of schedule and having dry camped since Kentucky we’ve decided to spend the weekend by the lake before arriving at Niagara Falls. The urban roads out of Cleveland were really bad as were the poor areas which we passed through, probably some of the worst we’ve seen. Rosina observed that over the past couple of days we’ve probably seen the best and the worst of this city. The journey to Geneva was pretty uneventful, much of it on I90 East. On arrival here we prepared the RV for a two day stay and then set off on our folding bikes for a closer look at the neighbourhood. It is really quite a nice area, an interesting mixture of lovely traditional clapboard homes on the lake shore coupled with a strip of touristy seaside amusements, bars and restaurants, and clearly a busy place during the peak vacation period which has now ended, resulting in many of the establishments being closed for the season, though some of them look to open at weekends only. 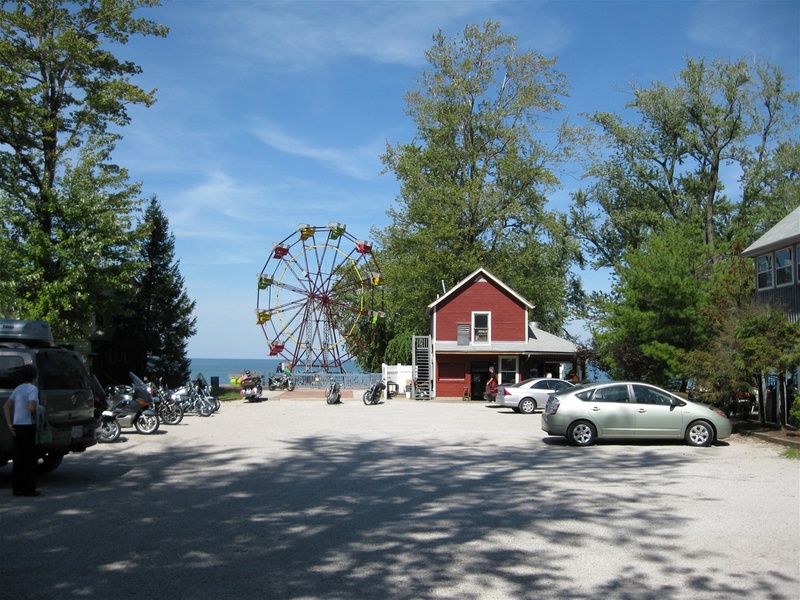 Our bike tour also took us in to Geneva State Park, where we had decided not to take the RV, even if they did have a campground, as hunting of sorts is permitted at the moment and we could often hear the crack of gun fire. The thought of sharing the forest with ‘Weekend Rambo’s’ fills me with dread and I wouldn’t consider doing so unless I’d had the RV fitted with Kevlar armour plating. After buying some cans of beer from a small local store we relaxed for a while enjoying the lovely warm sunshine before having a barbecue followed later in the evening with a sit by the gas powered campfire. The campground became quite busy during the evening with people arriving to enjoy the weekend. We’ve had a real problem gaining internet connection on this trip; surprisingly it was far easier when we were travelling over on the ‘Wild’ West side of the country. This evening I had to walk a very long way up to a bench near the campground office in order to get a strong enough Wi-Fi signal, and even then the bright sunshine was obscuring the screen. I will have to try again as we do need to download and upload before we move on from here heading for Niagara Falls. Tomorrow will be a lazy day, probably popping back down to the main street to look around the shops and try and purchase a modem cable for the computer as well as, hopefully, soaking up some sunshine.